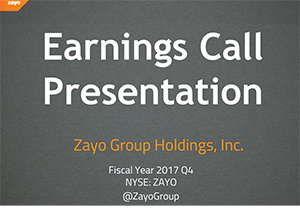 Zayo Group reported $638.0 million of consolidated revenue for the quarter ending 30-June-2017, including $509.1 million from the Communications Infrastructure segments and $128.9 million from the Allstream segment. Net income amounted to $23.2 million, including $11.3 million from the Communications Infrastructure segments and $11.9 million from the Allstream segment. The company reported $310.8 million of adjusted EBITDA, including $280.8 million from Communications Infrastructure and $30.0 million from the Allstream segment. Excluding Allstream, Zayo's churn was 1.2%1 , resulting in net installs of $1.4M, implying an organic growth rate of 3%. Hortonworks reported revenue of $37.4 million for the fourth quarter of 2015, an increase of 196 percent compared to the fourth quarter of 2014. Gross billings were $52.1 million for the quarter, a 63 percent increase over gross billings of $31.9 million in the same period last year. There was a GAAP gross profit of $21.7 million for the fourth quarter of 2015, compared to gross loss of $46.2 million in the same period last year. "We are pleased with our fourth quarter performance, which was highlighted by support subscription revenue growth of 146% year-over-year," said Rob Bearden, chief executive officer and chairman of the board of directors of Hortonworks. "We more than doubled our customer base in 2015 and exited the year with over 800 customers. As evidenced by our 159% dollar-based net expansion rate over the trailing four quarters, we are excited to serve as the preferred IT partner during this transformational period in the data management industry." 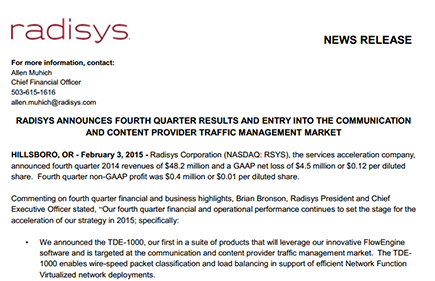 Radisys reported consolidated revenue of $47.0 million for Q2 2015, and non-GAAP earnings per share of $0.03, an increase of $0.10 year-on-year. For the second quarter of 2015, Software-Systems revenue was $14.2 million, compared to $9.7 million in the prior quarter and $10.4 million in the second quarter of 2014, representing increases of 46% and 36%, respectively. Revenue growth was primarily driven by accelerating MediaEngine deployments in support of VoLTE rollouts, including partial delivery of the $11M order noted above, and revenue tied to acceptance of FlowEngine lab systems. Embedded Products revenue was $32.9 million, compared to $39.0 million in the prior quarter and $39.6 million in the second quarter of 2014. While revenue was down both sequentially and year-on-year largely resulting from legacy end-of-life product transitions, Embedded Products revenue came in above expectations due to continued strength from the segment’s core customer base. Barracuda Networks reported revenue of $78.0 million for its first quarter of fiscal 2016, up 18% from $66.2 million in the first quarter of fiscal 2015. Appliance revenue in the first quarter of fiscal 2016 grew to $23.7 million, up from $20.8 million in the first quarter of fiscal 2015, and recurring subscription revenue grew to $54.3 million in the first quarter of fiscal 2016, up from $45.4 million in the first quarter of fiscal 2015, representing 70% of total revenue. However, there was a GAAP net loss for the quarter of $3.8 million, or $0.07 loss per share, based on a basic share count of 53.0 million. 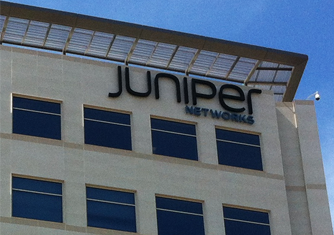 "We delivered revenue and non-GAAP EPS at the top end of our targeted range," said BJ Jenkins, president and CEO. "During the quarter, we grew total active subscribers, increased gross margin and maintained a 92.5% dollar-based renewal rate, speaking to the underlying strength of our business model." Radisys reported fourth quarter 2014 revenues of $48.2 million and a GAAP net loss of $4.5 million or $0.12 per diluted share. Fourth quarter non-GAAP profit was $0.4 million or $0.01 per diluted share. Software-Systems: Revenue growth of 10% to 20%, Gross Margins of 55% to 65% and an operating loss of $2 to $8 million. Growth will be enabled by a focus on VoLTE market opportunities with the company's MediaEngine products, providing wire-speed packet classification and load balancing for NFV telecom architectures with FlowEngine products and royalty growth resulting from its CellEngine software suite of products moving into small cell commercial deployments. Embedded Products and Hardware Services: Revenue decline of approximately 20%, gross margins of 25% to 30% and operating profit of $13 million to $17 million. “Over the last two years we have made incredible strategic progress in our core focus areas while simultaneously improving the operational execution of the company. This has positioned Radisys to enjoy meaningful growth opportunities in all of our Software-Systems product lines while at the same time benefiting from the stability and increasing levels of profitability within our Embedded Products business," stated Brian Bronson, Radisys President and Chief Executive Officer. 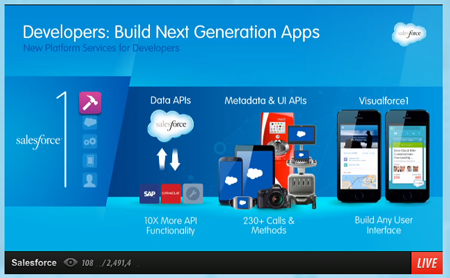 Salesforce reported Q3 revenue of $1.38 billion, an increase of 29% year-over-year, and 30% in constant currency. Subscription and support revenues were $1.29 billion, an increase of 28% year-over-year. Professional services and other revenues were $95 million, an increase of 33% year-over-year. There was a GAAP loss per share of ($0.06), and diluted non-GAAP earnings per share was $0.14. "Salesforce continues to be the fastest growing top 10 software company, with constant currency revenue and deferred revenue growth of 30% or more year-over-year," said Marc Benioff, Chairman and CEO, Salesforce. "Given the tremendous response to our Customer Success Platform, I'm delighted to announce a fiscal 2016 revenue projection of $6.5 billion at the high end of the range." Revenue for the company's full fiscal year 2015 is projected to be approximately $5.365 billion to $5.370 billion, an increase of 32% year-over-year. 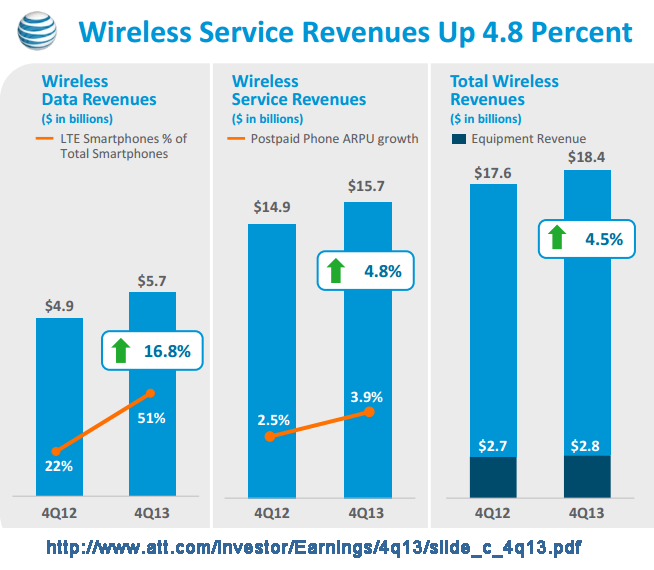 AT&T reported Q4 2013 consolidated revenues of $33.2 billion, up 1.8 percent versus the year-earlier period. Q4 net income totaled $6.9 billion, or $1.31 per diluted share, compared to $(3.9) billion, or $(0.68) per diluted share, in the year-earlier quarter. Adjusting special items, earnings per share was $0.53 compared to an adjusted $0.44 in the year-ago quarter, an increase of 20.5 percent. AT&T said it is on track to deliver the financial targets laid out with Project VIP. It expects consolidated revenue growth in the 2 to 3 percent range for 2014, including strength in wireless service and wireline consumer revenues. The company also expects stable consolidated margins with continued improvement in wireless margins helping offset Project VIP pressure in wireline. Adjusted earnings per share growth is expected to be in the mid-single digit range excluding any impact from future share buybacks. Wireless Service Revenues -- total wireless revenues, which include equipment sales, were up 4.5 percent year over year to $18.4 billion. Wireless service revenues increased 4.8 percent in the fourth quarter to $15.7 billion. Wireless data revenues increased 16.8 percent from the year-earlier quarter to $5.7 billion. Fourth-quarter wireless operating expenses totaled $14.5 billion, down 3.9 percent versus the year-earlier quarter, and wireless operating income was $3.9 billion, up 53.8 percent year over year. Phone-Only Postpaid ARPU -- Postpaid phone-only ARPU increased 3.9 percent versus the year-earlier quarter. Total postpaid subscriber ARPU, which includes high-margin but lower-ARPU tablets, increased 2.1 percent versus the year-earlier quarter. This marked the 20th consecutive quarter AT&T has posted a year-over-year increase in postpaid ARPU. Postpaid data ARPU increased 15.4 percent versus the year-earlier quarter. Smartphones and Tablets -- AT&T posted a net increase in total wireless subscribers of 809,000 in the fourth quarter. Subscriber additions for the quarter included postpaid net adds of 566,000. Postpaid net adds include 299,000 smartphones. Total branded smartphone net adds (both postpaid and prepaid) were 529,000. Total branded tablet net adds were 440,000. Connected device net adds were 398,000 -- Prepaid had a net loss of 32,000 subscribers primarily due to declines in session-based tablets; however, prepaid revenues increased both year over year and sequentially. Reseller had a net loss of 123,000 subscribers primarily due to losses in low-revenue 2G subscriber accounts. Q4 Postpaid Churn -- The company had its lowest-ever fourth-quarter postpaid churn of 1.11 percent compared to 1.19 percent in the year-ago quarter. Total churn was stable at 1.43 percent versus 1.42 percent in the year-ago quarter. Smartphones Reach Record 93 Percent of Phone Sales -- AT&T added 1.2 million postpaid smartphones in the fourth quarter. At the end of the quarter, 77 percent, or 51.9 million, of AT&T's postpaid phone subscribers had smartphones, up from 70 percent, or 47.1 million, a year earlier. The company sold 7.9 million smartphones in the quarter. More than 1 million of those smartphone sales were on the new AT&T Next program. Smartphones accounted for a record 93 percent of postpaid phone sales in the quarter. AT&T's ARPU for smartphones is twice that of non-smartphone subscribers. More than half of AT&T's postpaid smartphone customers now use an LTE device, and 77 percent use a 4G-capable device (LTE/HSPA+). Wireline Revenues -- Total Q4 wireline revenues were $14.7 billion, down 1.4 percent versus the year-earlier quarter and up 0.3 percent sequentially. Wireline service revenues were down 0.7 percent year over year. Total U-verse revenues grew 27.9 percent year over year and were up 7.0 percent versus the third quarter of 2013. Fourth-quarter wireline operating expenses were $13.3 billion, up 1.0 percent versus the fourth quarter of 2012. 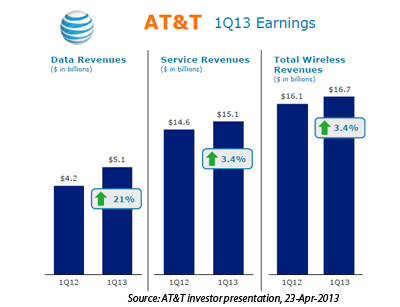 AT&T's wireline operating income totaled $1.5 billion, down 18.8 percent versus the fourth quarter of 2012. Fourth-quarter wireline operating income margin was 9.9 percent, down versus 12.0 percent in the year-earlier quarter, primarily due to declines in voice revenues, success-based growth, U-verse content costs and costs incurred as part of Project VIP. Consumer Revenues Increase 2.9 Percent -- Revenues from residential customers totaled $5.6 billion, an increase of 2.9 percent versus the fourth quarter a year ago and up 1.3 percent sequentially. Continued strong growth in consumer IP data services in the fourth quarter more than offset lower revenues from voice and legacy products. U-verse, which includes TV, high speed Internet and voice over IP, now represents 57 percent of wireline consumer revenues, up from 46 percent in the year-earlier quarter. Consumer U-verse revenues grew 26.8 percent year over year and were up 6.8 percent versus the third quarter of 2013. U-verse TV Churn -- Total U-verse subscribers (TV and high speed Internet) reached 10.7 million in the fourth quarter. U-verse TV had the lowest-ever churn in its history. U-verse TV added 194,000 subscribers in the fourth quarter with an increase of 924,000 for the full year to reach 5.5 million in service. AT&T has more pay TV subscribers than any other telecommunications company. U-verse high speed Internet had a record fourth-quarter net gain of 630,000 subscribers, to reach a total of 10.4 million, and a record annual increase of 2.7 million, or 34 percent. Overall, total wireline broadband subscribers were essentially flat in the quarter but grew year over year. Total wireline broadband ARPU was up more than 7 percent year over year. Total U-verse high speed Internet subscribers now represent 63 percent of all wireline broadband subscribers compared with 47 percent in the year-earlier quarter. About 59 percent of U-verse broadband subscribers have a plan delivering speeds up to 12 Mbps or higher. Total revenues from business customers were $8.8 billion, down 3.4 percent versus the year-earlier quarter, and were essentially flat from the third quarter. Revenues for next-generation business solutions — including VPN, Ethernet, cloud, hosting and other advanced IP services — grew 17.4 percent versus the year-earlier quarter. These services represent a $9 billion annualized revenue stream and are more than a quarter of business wireline revenues. During the fourth quarter, the company also added 78,000 business U-verse high speed broadband subscribers. Broadcom reported net revenue was $2.15 billion for the third quarter of 2013, up 2.7% compared with the $2.09 billion reported for the second quarter of 2013 and an increase of 0.8% compared with the $2.13 billion reported for the third quarter of 2012. Net income GAAP) was $316 million , or $0.55 per share (diluted), compared with a GAAP net loss of $251 million , or $0.43 per share (basic and diluted), for the second quarter of 2013 and GAAP net income of $220 million , or $0.38 per share (diluted), for the third quarter of 2012. "Broadcom delivered better-than-expected results across the board in the September quarter," said Scott McGregor, Broadcom's President and Chief Executive Officer. "With the Renesas transaction closed, the combined team is working diligently to deliver LTE revenue in early 2014. Looking forward, we are taking the necessary steps to tightly manage the business while focusing on strategic initiatives, including LTE, data center innovation and driving the next generation of home video with HEVC." Broadcom also noted that it has launched a global restructuring plan that includes a workforce reduction of up to 1,150 employees (some of whom originated from the Renesas acquisition). In connection with the plan, Broadcom recorded restructuring costs of $12 million in the third quarter of 2013 and anticipates that it will record approximately $20 million in restructuring costs in the fourth quarter of 2013. In September 2013, Broadcom agreed to acquire LTE-related assets from affiliates of Renesas Electronics Corporation for approximately $164 million in cash. Broadcom is gaining a dual-core LTE SoC that is ready for volume production and is carrier-validated by leading global operators in North America, Japan and Europe. Broadcom also receives high-quality multimode, multiband, LTE-A/HSPA+/EDGE modem IP that includes support for leading-edge features such as Carrier Aggregation and VoLTE. 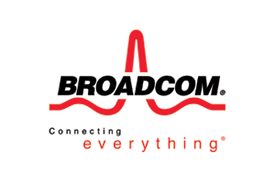 The acquisition adds quality patents and applications to Broadcom's IP portfolio and brings some of the world's most experienced cellular engineers to Broadcom. Broadcom said the deal will accelerate the launch of its first multimode, carrier-validated LTE SoC platform, which is now expected in early 2014. Cavium reported Q1 2013 revenue of $69.5 million, a 4.8% sequential increase from the $66.4 million reported in the fourth quarter of 2012. Net loss (GAAP) was $3.2 million, or $(0.06) per diluted share compared to $78.8 million, or $(1.56) per diluted share in the fourth quarter of 2012. 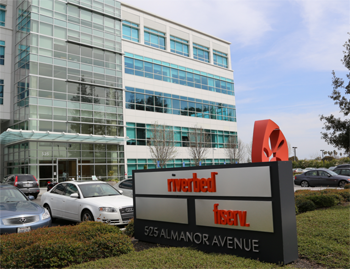 Riverbed reported Q1 revenue of $246 million, compared to $182 million in the first quarter of 2012, representing 35% year-over-year growth. This includes $52 million contributed by OPNET, which Riverbed recently acquired. GAAP net loss for Q1'13 was $8.1 million, or $0.05 per diluted share, compared to GAAP net income of $6.9 million, or $0.04 per diluted share, in Q1’12. F5 Networks reported revenue of $350.2 million for its second quarter of fiscal 2013, down four percent from $365.5 million in the prior quarter and up three percent from $339.6 million in the second quarter of fiscal 2012. GAAP net income was $63.4 million ($0.80 per diluted share) compared to $69.5 million ($0.88 per diluted share) in the first quarter of 2013 and $68.6 million ($0.86 per diluted share) in the second quarter a year ago. “As we indicated in our announcement of preliminary results on April 4, service provider revenues for the second quarter came in significantly below our expectations,” said John McAdam, F5 president and chief executive officer. “We believe this was primarily due to project delays, which caused customers to postpone orders that we had expected to close during the quarter. 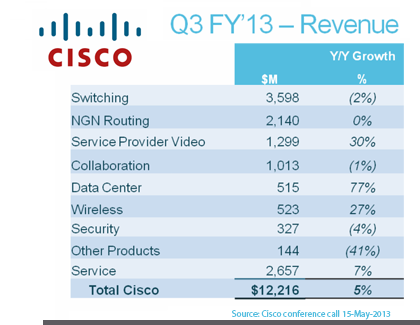 The weakness in sales to service providers was especially pronounced in North America. In addition, sales to the Federal government were also below our internal forecast as a consequence of continuing uncertainty over the impact of sequestration and other efforts to reduce Federal spending. Infinera reported Q1 revenue of $124.6 million, compared to $128.1 million in the fourth quarter of 2012 and $104.7 million in the first quarter of 2012. The GAAP gross margin for Q1 was 34% compared to 34% in the fourth quarter of 2012 and 39% in the first quarter of 2012. GAAP net loss for the quarter was $(15.3) million, or $(0.13) per share, compared to net loss of $(16.1) million, or $(0.14) per share, in the fourth quarter of 2012 and net loss of $(20.6) million, or $(0.19) per share, in the first quarter of 2012. “Our first quarter performance demonstrated solid execution in a traditionally slow quarter for the industry,” said Tom Fallon, president and chief executive officer. “The DTN-X platform continued to gain traction in the market. During the quarter, we received purchase commitments from six additional customers, including two new to Infinera, for a total of 27 DTN-X customer commitments to date. Customer deployments were strong and we shipped a record number of 100G ports. Radisys boosted its financial guidance for Q4 2012 saying it now expects revenue to be near the high end of the range provided on October 30, 2012 and positive non-GAAP earnings per share compared to a previous guidance range of ($0.06) to breakeven. "A strong finish to the year in our software and solutions business along with continued operational focus enabled us to return to profitability more quickly than originally expected,” commented Brian Bronson, Radisys President and Chief Executive Officer. "Additionally, we generated positive cash flow in the fourth quarter and have adequate liquidity to retire the $16.9 million of convertible debt coming due in February 2013. We will set a specific earnings release and conference call date over the next month. I look forward to sharing the full results for the quarter, go forward guidance, and an update on the strategic objectives we outlined in October at that time."